Preparation for the Cognac Syrup: Place all ingredients in a small pot on medium heat and bring to a boil, stirring until the sugar has dissolved. Reduce to low heat and cook slowly for 15 minutes. Allow to cool. Flan Preparation: Preheat the oven to 350°F. Melt the sugar in a medium-sized pot on medium heat. Stir constantly until the sugar has dissolved and it turns amber in color. Transfer the caramel to a rectangular mold and distribute it so that it covers the bottom and sides of the mold. Allow to cool completely. Place the rest of the ingredients in a blender and blend until everything has been well mixed. Pour the mix over the caramel into the mold and cover with aluminum foil. Bake for 50-60 minutes in a water bath, or until the flan appears to be firm when shaken. Allow to cool completely. To remove from the mold, run a knife along the inside edges to separate the flan, and turn it over onto a plate. Add the Honey Nut Cheerios™ just before serving. Store the remaining cognac syrup in a glass bottle. 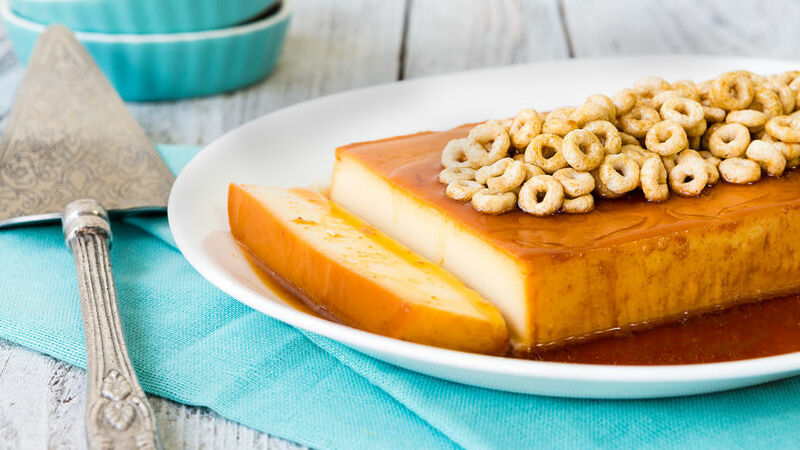 You can never go wrong with flan for dessert! And this recipe, made with cognac syrup, is perfect for a special occasion. Here you'll find the recipe to make the cognac syrup, which works not only with this flan, but with many other desserts like pastries, cakes, etc. Once the syrup has cooled completely, you can store it in a glass bottle in the refrigerator for up to a month.